Play has come to an end on Day 4 of the World Poker Finals with 8 players remaining. 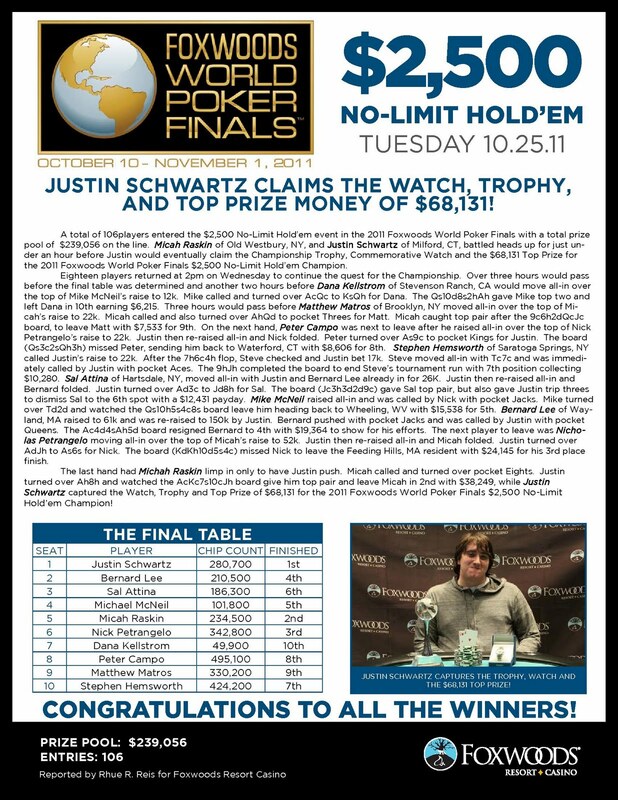 Play will resume at noon tomorrow and continue until we reach the World Poker Tour television final table of six. The board runs out [Ad][Jc][4c][8h][Qc] and Klodnicki improves to trips to win the pot and eliminate Rossi in 9th place for $42,339. After being crippled when his pocket nines could not hold up against Eli Berg's A-9 when an ace hit the flop, Hoyt Corkins was knocked out just a few hands later by Jonathan Little. Hoyt Corkins officially finishes in 10th place for $34,676. Jack Schanbacher has been eliminated in 11th place when his K-Q failed to improve against Daniel Santoro's pocket aces. He takes home $34,676 for his finish. Matt Glantz moves all-in from the small blind with K-8 and iss called by Jonathan Little in the big blind with A-9. Glantz bricks out the board and is sent to the rail in 12th place for $34,676. The players are currently on their last 15-minute break of the day. When play resumes, the blinds will be increased to 5,000-10,000 with a 1,000 ante. With 12 players remaining, the average chip stack is now 473,000. Cards on the table after an all-in and call. The kings held up. Daniel Santoro (left) contemplates calling Eli Berg's all-in. The chip stack of Steven Brackesy. Hoyt Corkins and Andy Frankenberger on Day 4 action. Matt Glantz and Jonathan Little on Day 4 of the World Poker Finals. Steven Brackesy on Day 4 of the World Poker Finals. The blinds are being increased to 4,000-8,000 with a 1,000 ante. James Frangoulidis gets all-in before the flop with pocket sixes but runs directly into the pocket aces of Chris Klodnicki. Klodnicki's aces hold up and Frangoulidis is eliminated in 13th place for $27,563. Chris Klodnicki is now over 900,000 in chips. On a flop of 10-8-7, Matt Stout gets all his chips in the middle with 10-8 against the J-9 of Steven Brackesy. Stout is unable to fill up and is eliminated in 14th place for $27,563. Peter Politano gets his last few chips in before the flop with [7c][7s] and is called by Daniel Santoro with [Kd][Ks]. The board bricks out for Politano and he is eliminated in 15th place for $27,563. The players are currently on a 15-minute break. 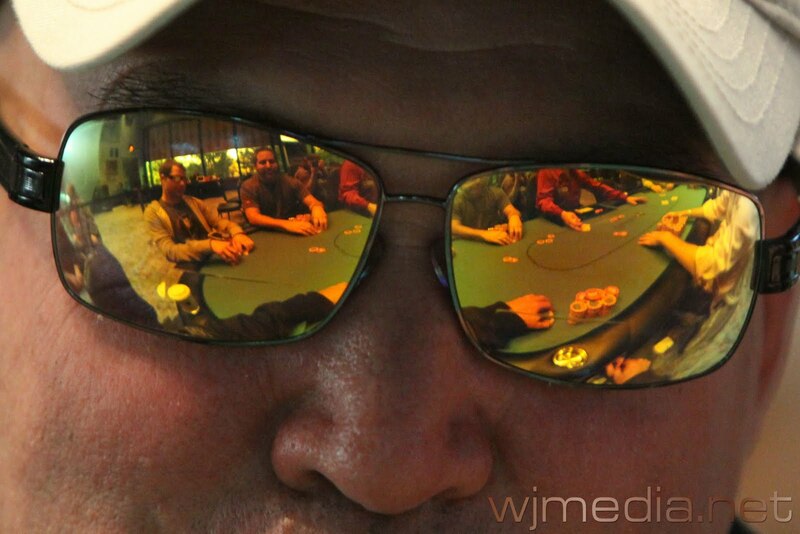 When play resumes, the blinds will be increased to 3,000-6,000 with a 1,000 ante. 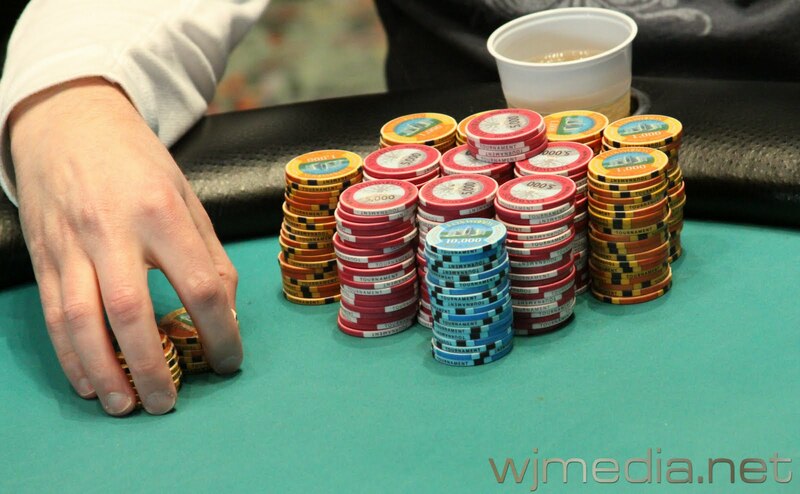 With 15 players remaining, the average chip stack is now 378,000. Bernard Lee raises before the flop and Matt Stout moves all-in. Lee calls with pocket nines and is up against Stout's pocket kings. Stout's kings hold up to cripple Lee. Just a few hands later, Lee is eliminated in 16th place by Hoyt Corkins. The flop brings no help to Markholt and a king on the turn sends him to the rail in 17th place for $23,117. Tom Schreiber gets all of his chips in before the flop with A-K against the Q-J of Steven Brackesy. However, a jack on the flop sends Schreiber to the rail in 18th place. Players have returned from break and the blinds have been increased to 2,500-5,000 with a 500 ante. With 18 players remaining, the average chip stack is now 315,000. Joshua Bergman has been eliminated from the World Poker Finals Main Event in 19th place for $19,916. Mike Dentale has been eliminated in 20th place for $19,916. Lawrence Greenberg has been eliminated by Christian Harder after Harder flopped two pair to Greenberg's top pair. Greenberg takes home $19,916 for his 21st place finish. Daniel Colman has been eliminated when his pocket nines failed to improve against the pocket queens of Bernard Lee. Colman takes home $19,916 for his 22nd place finish. Cornel Cimpan has been eliminated in 23rd place for $19,916. Andy Powderly has been eliminated in 24th place for $19,916. Allen Kessler has been eliminated from the World Poker Finals Main Event in 25th place for $19,916. Dan Colpoys has been eliminated from the World Poker Finals Main Event in 26th place for $19,916. Tony Biceglia has been eliminated in 27th place when his A-8 could not improve against the pocket jacks of Lawrence Greenberg. Day 4 of the World Poker Finals is Underway! Play is now underway on Day 4 of the World Poker Finals. There are 27 players remaining and the blinds are starting at 2,000-4,000 with a 500 ante. 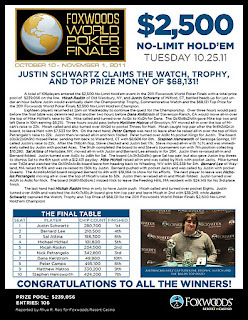 Click "Watch LIVE Feature Table" at the top of the page to view the live feed. You can watch today's play, starting in about 10 minutes, by clicking "Watch LIVE Feature Table" at the top of the page.